Forgive the somewhat cheesy title, but when you do a lot of running, any song that has a peppy beat is fair game :) I have been enjoying my days off, and to celebrate all this free time we decided to host a little party. I have forgotten how much fun it is to have lots of people over and just laugh, drink, catch up on news and eat wonderful food. 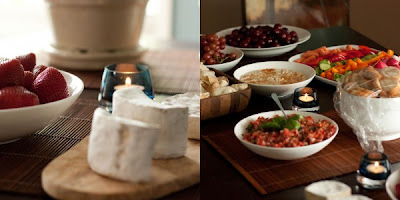 I love preparing the house for the arrival of guests and try to keep things very simple: home-made hummus, veggies and pita bread, some home-made bruschetta with garden-grown basil, in-season fruit and some good cheese...and lots of wine of course. 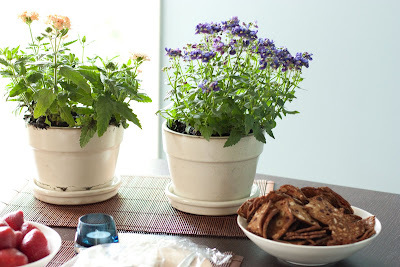 For flowers, I bring in some of my pots from outside - it's inexpensive and befitting to summer. The hummus disappeared in record time and you could see where people had scraped the side of the bowl to get the last bit of goodness out. I have decided to post the recipe because it is really easy to make and it tastes fabulous. place in a nice bowl (I use a slightly rounded-edges soup bowl) and spread the hummus out, drizzle with extra-virgin olive oil and sprinkle with some red paprika. As with any recipe, you can experiment - if you prefer more garlic, add more - if you prefer less of a lemony taste, don't put in as much lemon juice. I serve this with a variety of sliced veggies and pita bread. Place the hummus in the fridge until your guests arrive - and then enjoy.